Weird. That's what this album is, outright bizarre. It's what you'd hear at a Martian victory party after windowpaning your way to nirvana. Tempo changes are the rule, many times in the same song at times until you just quit trying to count or keep up. To do so invites insanity, which is perhaps what this record seeks to chronicle. One mind's bending beyond the point of return at warp speed and then off you go, dazedly staggering with a grin on your face. No one else gets why you're doing this but inside what's left of your synaptic relays... the story is much much different, if it is even a story or just mentally unhinged excursions in varying degrees of borderline psychosis. This one does not leave your thoughts clear, it is a continual assault on all levels of sensory perception, like free floating in the vacuum of space surrounded by anti-matter. 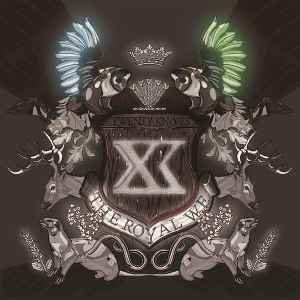 "The Royal We" was preceded by an EP entitled "The Royal Invitation" which cordially entreated you to partake in hearing this insidious, toxic monster and somehow it was a bit more focused (and free, I might add, directly from the band's website) but once you press play and begin your journey to the computorium, you'd better have checked your expectations at the door. This is not the sort of release you'd expect from Hymen, it's more akin to Squarepusher meeting up with, say, The Vampire Rodents and Vindicatrix in a blender fueled by hashish, mescaline and ergot. Dear god, I can feel my face breaking into an idiotic, glazed smile even now as I listen yet again. What do people who make this kind of music even look like, I could find no actual photographs nor was I able to garner any recognition of the group's name from amongst my admittedly small circle of friends. Or was that fiends... ha ha, a joke. There's a nicely disembodied, narrative voice throughout "The Royal We" which guides us along on our journey. The combination of frenetic drums and wickedly executed vocal harmonies are something which I am more than a little impressed by. How many acts do you know of who have a plodding rhythm broken up by squeals of mutilated white noise which then degenerate into some kind of viciously manipulated accordion whimpering, crying for mercy. This is the objective and methodology of what Twenty Knives do: they torment sound until it collapses into twitching, bloody rubble. Every available millisecond of recording space is crammed to the limit with heavy servings of what can only be guessed were once chimes, bells, percussion, synthesis, recognizable words, and do I hear some kind of gospel choir being chopped up into tiny pieces? It's grimy, it's abrasive and goddamn is it funky. Twenty Knives bring the groove, they get on down in a ferocious manner befitting the regal theme of their debut. I guarantee you won't be able to sit still listening to this one because it slithers out of your speakers, violently having it's way with you. One song is beat driven mania, the next is spaciously designed classical minimalism, after that it's an obnoxious computer serving you coffee and drugged pie while cracking terribly unfunny jokes as it insults you in a faultlessly polite manner for pressing the wrong (according to it's prejudicial settings) button during your interrogation. User one is always memorable but you're not user one is the maxim and such arrogance is fine by me, especially when it's as gloriously disturbed as this.